Alexandria National Cemetery, Andrew Russell Photograph. The Alexandria National Cemetery was founded as the "Soldiers Cemetery" or "Military Cemetery" in 1862 and was perhaps the first-established of the Civil War cemeteries which became part of the National Cemetery system. Despite this, African American soldiers who died in Alexandria were apparently first buried in the towns public Penny Hill Cemetery (1863-March 1864), then in Freedmens Cemetery (March-December 1864), and finally in the Soldiers Cemetery, beginning the last week of December 1864. The burial of black soldiers in the Soldiers Cemetery caused something of a controversy, one more bureaucratic than racial. The African American troops were ultimately interred in a segregated section on the south end of the burial ground. The list below is taken from The Roll of Honor. Names of Soldiers, Victims of the Rebellion, Buried in the National Cemetery at Alexandria, Virginia, (Washington, D.C.: Government Printing Office, 1866). It has been cross-referenced with the "Gladwin Record" of deaths and burials of freed people, with Edward A. Miller, Jr.s article, "Volunteers for Freedom," and, to a certain extent, with the National Park Services Civil War Soldiers and Sailors System (CWSS) in order to correct errors in names and units. There is no guarantee, of course, that all information is correct. The Roll of Honor contains a number of errors in unit designations; for instance; many men are recorded as belonging to U.S. Colored Troops regiments when, in fact, they belonged to state units. While only a small fraction of names has been checked against the CWSS, some discrepancies in unit designations have been found, and other names are simply missing from the Park Service data. In each case, the CWSS data has not been substituted, in order to remain faithful to the Alexandria data and because the ultimate sources of the CWSS data may be no more reliable. Additionally, there is naturally variation in names, but the "best guess" is presented here. Text in parentheses suggests spelling variants in the documents. Edward A. Miller, Jr. has done an impressive job of examining the gravestones and then plowing through an enormous number of military service and pension files. His fine article corrects many mistakes, particularly with regard to death dates. It also reinforces the impression, given by the Gladwin Record, that most of the "death dates" recorded by The Roll of Honor are actually burial dates. It is assumed that, while mental and copying errors occurred frequently, most recorded dates have some significance. Therefore, where there are conflicts between dates, but the dates are chronologically close, the earlier has been taken as the death date and the later as the date of burial. Many of these casesin which the death took place in 1864 and the burial in January 1865represent re-interments from Freedmens Cemetery to the National Cemetery. Where three dates appear, the first is suggested as the death date, the second as the original interment in Freedmens Cemetery, and the third as the final burial in Alexandria National Cemetery. Where sources give dates that are completely incompatible, the Roll of Honor data has been retained. Reference should be made to Ed Millers list, which includes additional names mentioned in neither record, including Civil War veterans buried long after the war. Finally, entries that are italicized indicate soldiers that are named in the Gladwin Record as presumably buried at Freedmens Cemetery but are not mentioned in the Roll of Honor. 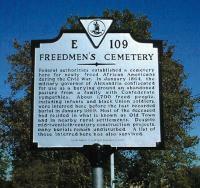 This suggests three possibilities: that the men were never buried in Freedmens Cemetery; that they were not re-interred from Freedmens Cemetery to the National Cemetery; or that the records of Alexandria National Cemetery simply do not record them because of the loss or confusion of their names. The traditional abbreviations for the names of U.S. states are used. Quillar (Quillen), Sgt. Elias H.